Shinobu Takeuchi (Mikako Tabe) becomes a homeroom teacher at Ooki Elemntary School in Osaka, Japan. Shinobu loves mystery novels and can't stand things when it doesn't turn out right. 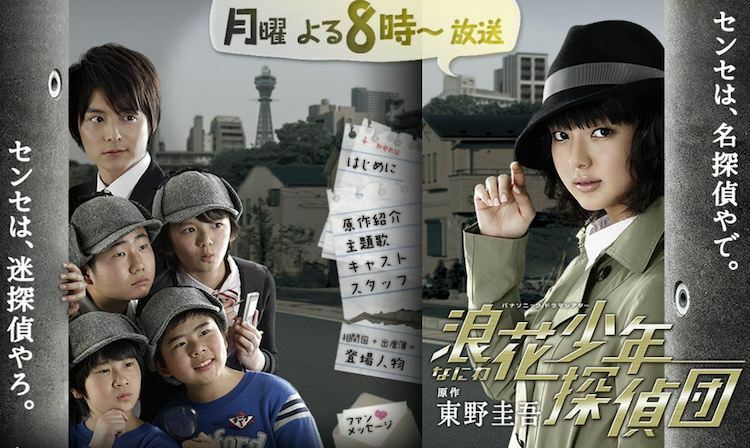 Shinobu then attempts to solve a difficult cases that even detectives can't solve. Based on the Keigo Higashino novel "Naniwa Shonen Tanteida" (published December, 1988) and its sequel "Shinobu Senseni Sayonara" (published December 12, 1996). Jay Quintana Dec 01 2014 11:32 am Fun series, great characters. Sometimes things get a little too silly, though. John Sep 22 2012 9:31 pm I'm on episode 7 right now and I have to say I've been enjoying this drama. Shinobu sensei can be tough but also kind. This drama reminds me of the drama School!! with Yosuke Eguchi - each episode somehow revolves around one or more students and then the rest of the series they are more like extras (with the exception of the 3 main boys + the narrator). I find it funny how Shinobu and Honma try to start something but are constantly interrupted by both Shindo and Haruna. Even though he is credited towards the bottom of this list, the story is narrated in the eyes of Oshiro. More so, the Harada boys are portrayed by real life brothers, making their family moments more real like. For those who are wondering, in Episode 7, the young boy is portrayed by So Koyama (who portrayed as Taiyo in "Good Life, Arigatou Papa, Sayonara"). Whida Aug 12 2012 10:01 am Aahh~ cant wait for this drama! Hope someone would uploaded and make the subtitles for this drama~!! !